This example was found on Leetcode. In this tutorial, I'll walk extensively through my logic for solving this problem. If you'd just like to see the answer, this link scrolls down the page to it. Turns large tick values (in the billions, millions and thousands) such as 4500 into 4.5K and also appropriately turns 4000 into 4K (no zero after the decimal). The first solution that came to my mind was to calculate all possible combinations through a nested for loop. In a nested for loop, for each item in the list, I'll compare it to all items in the list. Let's setup that logic below. In the problem statement, there was mention to "not use the same element twice". The logic above breaks that rule because we compare each element from the outer loop to the same element in the inner loop. For example, on our first logged message, we compare 2 to 2 which breaks our rule. In order to write logic so that we don't compare numbers to itself, I think it'd be helpful to track the indices of items we iterate over. In a future iteration, if we arrive at a point in which we compare the same index of the inner loop to the outer loop, we can pass as that wouldn't yield a correct solution to this problem. To track the index of each item looped over in the list, let's use the enumerate() function built into Python's standard library. Essentially, the enumerate() function adds a counter to an iterable. Our original list, nums, is an iterable. If we pass our nums list to the enumerate() function, we're returned an enumerate object. This is an immutable object so it can't be modified in place. This object contains a list of tuples (immutable elements) - each with a pair of an index and an item value. Let's cast our enumerate object to a mutable list using the list() function. We can now see the indexes and values in our nums list. In our list, for each tuple, the first value is the index of the item in our list nums and the second value is the item value. The table below also shows this. Remember, our enumerate object is an iterable so we can loop over each of the indices and values. Now let's use this similar logic for the enumerate() function to get the indices in our earlier nested for loop. In the problem statement, there was mention to "not use the same element twice". Now that we can track the indices of each element we iterate over, we can incorporate logic to ensure we don't compare a value to itself. In regards to our problem statement, we want to check what two numbers in our list add up to our target. Let's incorporate this logic in the if clause. Let's also wrap our logic in a function so when we find our solution, we can break out of the function and return the indices. Given a list of integers, return indices of the two numbers such that they add up to a specific target. This logic seems to work! However, what happens if the length of our list items drastically increases - perhaps from 4 items to 9000? Also, what if the target is the sum of the 8999th and 9000th items in the list? That would be considered our worst case scenario. Validating the runtime of our code as the length of list items drastically increases will help us understand the time complexity of our code. Later, we'll visualize this time complexity. Below is a very simple example of our setup data. Note, how I create a list of nums assigned to [0, 1, 2, 3, 4, 5]. I purposely make the target 9 so that it's the sum of the last two values in our list. Let's put this logic to setup nums and target in a function since we'll re-use it later. Given a max_list_value, calculate a worse case scenario for two_sums setup data. Create a list of nums from 0 to our max_list_value with a step of 1. Our target is the sum of the last two values in our list of nums. Below, we run our two_sums function multiple times, each time with a new and longer list of items in nums, and we record the time it takes to complete the two_sums calculations to return the result. Below, let's visualize the seconds to compute for each run of two_sums with a certain number of list items in nums. This curve looks exponential! The reason for that is that by time complexity standards, we perform O(n²). n is the length of items in nums and we essentially perform n² iterations because for each value of n, we multiply it by all other values in n.
We generally want to avoid O(n²) time complexity because as n increase, our program will take exponentially longer to complete. However, on the good side, our solution is just O(1) by space complexity because we just store the resultant indices. Generally, there's a tradeoff between time and space complexity. In the next method to solve this problem, we'll trade off time complexity for space complexity. So our code will run much quicker, but we'll save more on disk. We don't need to loop through the entire list multiple times. Rather, we can develop an alternative method that saves the index and values of numbers in the nums list as a dictionary. Once we have that dictionary, we can do many quick O(1) lookups to see if any two numbers we've iterated over add up to our target. Let's say we're iterating over the four items in nums above. As we iterate over the first three items, we could store them in a dictionary seen below by dict_past_iterated_nums_and_indices. The keys are the items in nums and the values in the dictionary are the items respective index in nums. In a Python dictionary, in a O(1) time complexity operation, we can lookup a key and are returned a boolean value. 1 is a key in dict_past_iterated_nums_and_indices. But, there's no key with a value of 5 in dict_past_iterated_nums_and_indices. We know 4 is the last item in nums. That would be the last item we iterate over in a single loop over the items in nums. Our target is 7 so once our iteration reaches 4, we can easily lookup if there exists a number in which target-4 which is equal to 3 exists in dict_past_iterated_nums_and_indices. It does! Based on this logic, we need just one iteration over our nums in order to find the solution. Let's code up this logic in a function. This is the best answer in this tutorial. 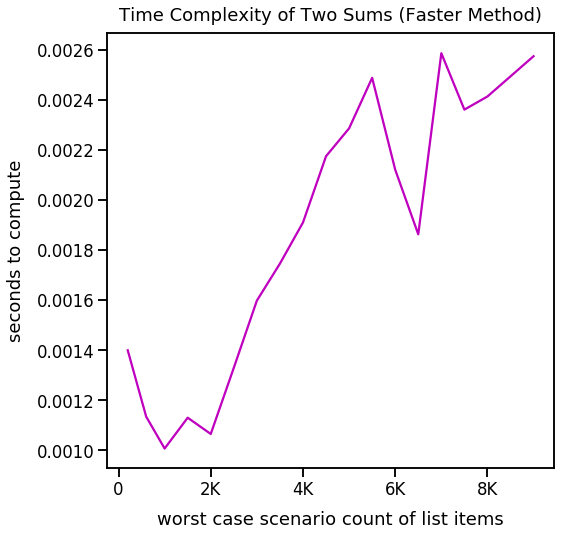 Let's visualize the time complexity of this two_sums_faster functions. This line looks to have a consant positive slope, but it's nearly not as steep as our first brute force method. Let's compare the two on the same plot. This visualization tells a much clearer picture of the differences in our two functions to compute the solution. 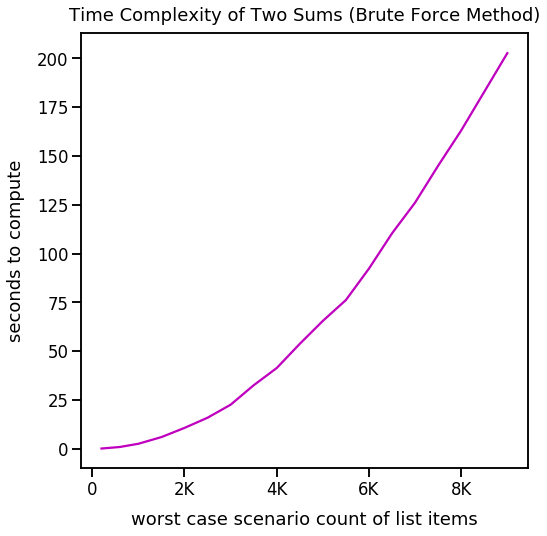 Our first brute force method has O(n²) time complexity while our second faster method has just O(n) time complexity. 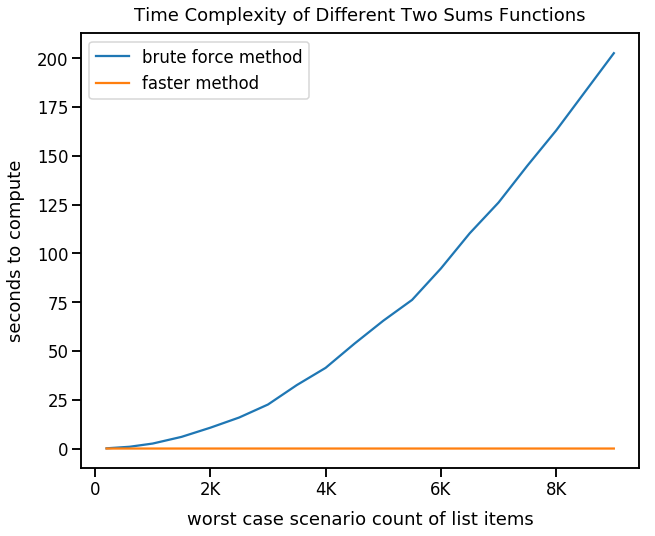 Our first brute force method has O(1) space complexity while our second faster method has O(n) space complexity.